The Cat muzzle allows better ventilation for your cat's safety and comfort. Designed for short nose animals with or without breathing problems. Designed to restrict aggressive behavior while allowing them to breathe normally. Velcro closure. - Place muzzle over the cat's snout. Make sure it fits comfortably. - Bring straps behind cat's head and fasten with velcro. Do not over-tighten. IMPORTANT: Use only with direct supervision. 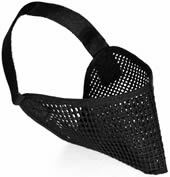 Do not leave your cat muzzled for long periods of time. Prolonged use of a muzzle inhibits cats natural cooling system, which can result in a life-threatening situation for the animal. Seller makes no warranty, expressed or implied, when this product is used on cats known to be vicious.